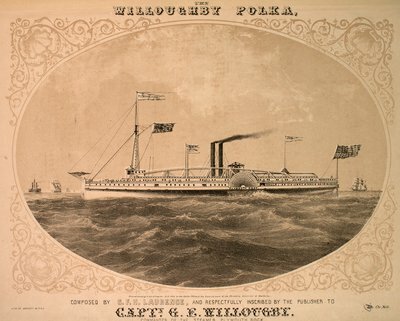 The "Willoughby Polka" by composer G. F. H. Laurence, dedicated to Captain George E. Willoughby, with a lithograph of the steamboat PLYMOUTH ROCK on the cover. The piano music is available from the Music for the Nation: American Sheet Music collection in the American Memory collection at the Library of Congress. "The Willoughby Polka" "Composed by G. F. H. Laurence, and Respectfully inscribed by the Publisher to Capt'n G. E. Willougby [sic]. Commander of the Steamer Plymouth Rock" "Lith. of Endicott & Co. NY" "Entered ... Congress A.D. 1854 in the Clerks Office of the District Court of the Northern District of New York" "25 Cts Nett"